Revision knee replacement surgery involves replacing part or all your previous knee prosthesis with a new prosthesis. Although total knee replacement surgery is successful, sometimes the procedure can fail due to various reasons and require a second revision surgery. Next the tibial component along with the old plastic liner is removed. The damaged bone is cut and the tibia is prepared to receive the new component. Like the femur, the lost bone is replaced either by a metal wedge or bone graft. Then, a new tibial component is secured to the end of the bone using bone cement. A new plastic liner will be placed on the top of the tibial component. 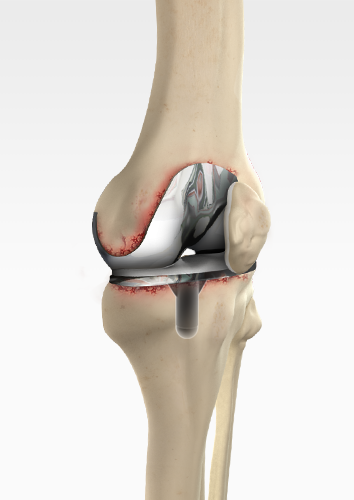 If the patella (kneecap) has been damaged, your surgeon will resurface and attach a plastic component. The tibial and femoral components of the prosthesis are then brought together to form the new knee joint, and the knee muscles and tendons are reattached. Surgical drains are placed for the excess blood to drain out and the incision is closed.